An earthdog trial tests the working ability and instinct of the small, short-legged terriers. These dogs were bred to hunt vermin and other quarry, which lived in underground dens. Earthdog den trials involve man-made underground tunnels that the dogs must negotiate, while scenting a rat, the “quarry”. The dog must follow the scent to the quarry and the “work” the quarry. Depending on the sanctioning organization, “working” means barking, scratching, staring, pawing, digging, any active behavior. The quarry is protected at all times by wooden bars across the end of the tunnel. The hunting encounter is controlled, and neither dog nor the quarry, usually two rats, are in any danger. Now Buddy is by no means a terrier – although we aren’t totally sure what all makes up his handsomely lean and lanky skinny body. But the important thing is HE thinks he’s a terrier who is practicing so he can qualify for the Olympic ottoman eating earthdog trials! Over the past two years, there have been a few numerous earthdog trial tests in our home. Round one, Buddy eats all four corners of the ottoman (on which you can see him lounging below). Round two, I patch the corners. Round three, Buddy eats all four patches off the ottoman. Round four I make a slipcover. Round five, Buddy eats the four corners of the slipcover. Round six, I make another slipcover. Rounds seven, nine, and eleven, Buddy removes the slipcover (after chewing a tender morsel of cloth from one corner) and digs deeper into the four corners – one in particular where he KNOWS the rat must live. Rounds eight, ten, and twelve, I put the slipcover back on and say “Buddy that is bad bad bad, you should be ashamed” whereupon he slinks into the kitchen hanging his head in shame runs into the kitchen trying to keep the grin of triumph off his face. The wonder dog is getting a rubber rat for Christmas! Maybe it will convince him that he’s won the Olympic earthdog trials – ya think? That cute little stinker, LOL! I recommend something you can pick up at pet stores: bitter apple spray. It WORKS! 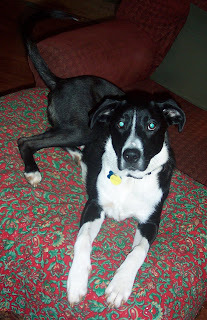 Our pooch (now in doggy heaven) was "mouthy" when we first brought him home. He liked to nibble on my hands and those puppy teeth are razor sharp! We invested a couple of bucks in that spray and it worked like a charm. After just two encounters, all I had to do was just SHOW him the bottle, and he would bark and run, LOL! You can spray it on your ottoman, and he will never bother it again. Promise! You go Buddy!, your such a good dog to keep Jill busy and give her something to do. Good Dog! Can't help you there.. I followed your comment link on Bill's blog and couldn't stop laughing when I read you're Jill married to Jack. Too funny! Oh Buddy, you are such a bad boy! Did the play rat help?